After passing IVA, Andy said to me that I needed to put about 500 miles on the clock and then bring it back to the factory to be set up properly once everything had time to settle down. I was keen to get this done as I haven't been entirely happy with the handling up til now, particularly under powerful acceleration as the car seemed quite 'twitchy' and a bit like a high power front wheel drive car with a bad dose of torque steer. I had discussed this with Andy and he was confident this would be resolved quite easily... and as usual he was right!!!! Having had several consecutive days of early Spring sunshine, it was no surprise that on the day of the factory visit the forecast was horrible!!! So, arriving at the factory with the car on the new Brian James Race Shuttle and one eye on the weather, the trailer was unloaded and Andy was straight out with his various gauges and spirit levels. First off damping was adjusted slightly on the front suspension. Then the rear alignment was adjusted, adding a fair bit of toe in. Next, rear ride height was dropped about 10mm and damping adjusted. The final tweak was then to set the rear camber angles correctly as there was a quite a bit of variation between left and right wheels. Having made these adjustments, it was off up the road with Andy at the wheel. As a passenger, the car seemed stable and responsive through the various bends and roundabouts and was pulling up in a straight line under braking. Andy then asked me to drive the car to see how it compared. Literally a mile up the road I could tell that the changes had make a huge difference. The car now went in the direction it was pointed, it didn't twitch under acceleration and it didn't follow the camber of the undulating roads as it had previously. We got back to the factory just before the heavens opened and loaded the car back on to the shuttle for the short ride up to EDA in Castleford to have the carb set up. Ken rang just as I was leaving to say he had been called away to Donington, but 'Dyno Den' his colleague would be there to sort out the carb issues I had been experiencing. Arriving at EDA, Denis decided to change the plugs and increase the plug gap to .040" from .025" before looking at the carb. This didn't seem to make too much difference so the carb was swapped for a brand new one. Float levels were checked and adjusted and vacuum was set up. Several tweaks later I headed back home hoping that the slow running problems were now a thing of the past - unfortunately I am still getting lumpy tick over and uneven performance sub 2000rpm particularly when coasting. A further trip back to Ken is required. 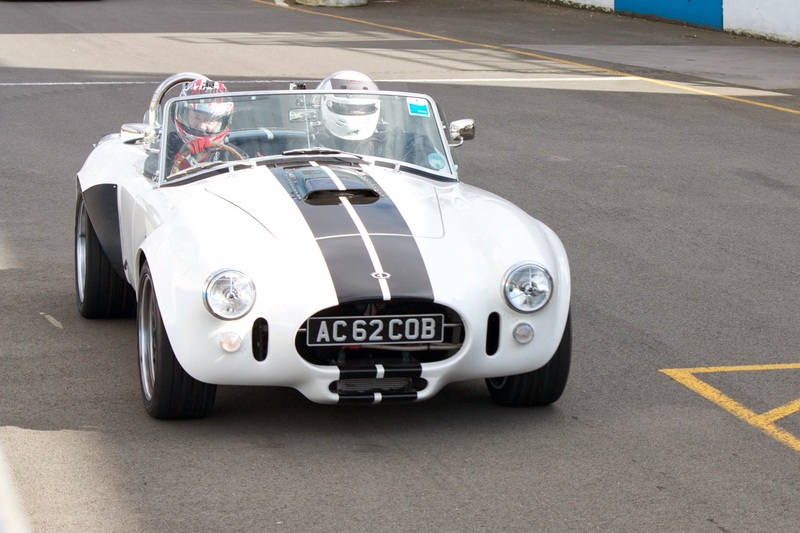 Had a phone call from Chris Morgan, a race instructor friend of mine on Thursday evening saying he was involved with a track day at Donington on Sunday and he wondered if I fancied taking the Cobra for spin... Really? It took me about a nano second to say YES!!! The track day was being run on the full GP circuit and Im a big fan of this track although I have never driven around it before. As I wasn't able to get on track til the afternoon session, I wanted some sighting laps before taking the Cobra out - there was some seriously fast kit on track including M3's, Clio Cup Cars, Caterhams and the like and I didn't want to be getting in the way - I got Chris to take me out in his mate, Pete Edwards, Clio Sport. 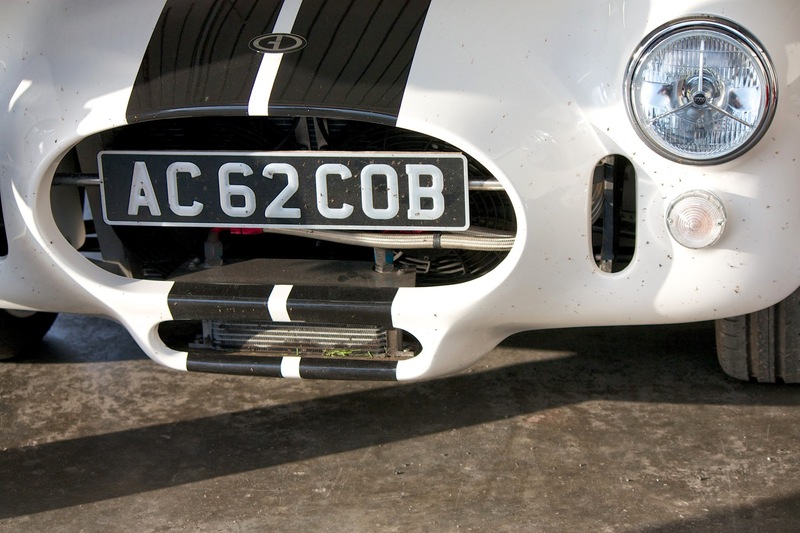 With a couple of laps completed it was back to the pits to warm up AC62COB, affectionately known as 'Cobie'. And then it was me in the driving seat with Chris sat next to me giving me the racing lines to get the most out of both car and circuit. Lights are green which means... Go! Go! Go! With a few laps under my belt, I was beginning to feel more confident and was happy to take the Cobie out with Chris by my side, replaced instead by a couple of friends. Will from work and my co-builder Ali had come with me and were desperate to get out on track. Will was the first to brave it and we had a good few laps seeing lap times falling but as confidence builds as does exuberance and with that comes danger. On my penultimate lap with Will, having exited the Melbourne Hairpin safely, I built up a fair bit of speed heading to Turn 11, Goddards (the last turn before the start finish straight), and I left it a bit too late to brake. Standing on the middle pedal for all my worth, all four wheel locked up and I got into a bit of a wobble. Fortunately my season karting has given me some valuable experience on track and I was able to get the car back in a straight line and through the turn without coming off circuit. This could have been pretty nasty as there isn't much run off on this slow turn. After that it was time to return to the pits to calm both myself and Cobie down and to do some vital check on engine oil and brake disc temperatures. All ok there, in fact Chris suggested I wasn't trying hard enough as the brakes were still way too cold to be effective. Feeling all sensible again it was time to take Ali out on track. 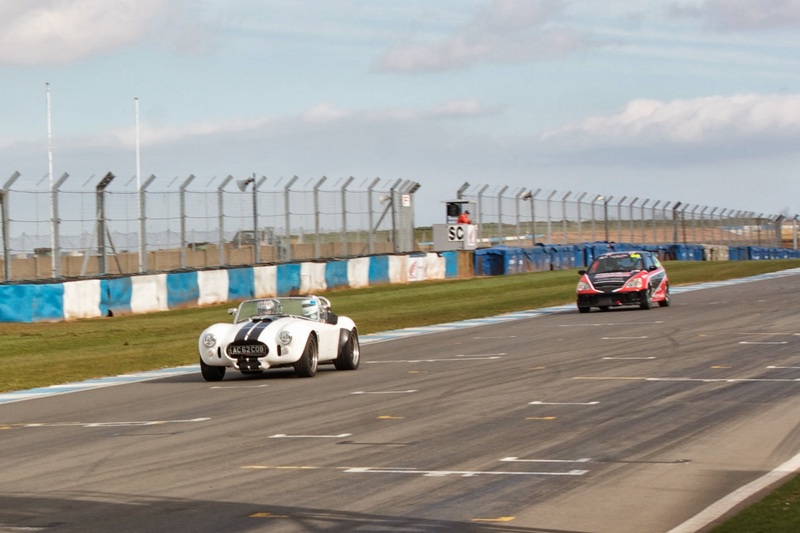 A half dozen or so fast laps followed and apart from a mild drift at the Esses there was no drama. Back once again to the pits. 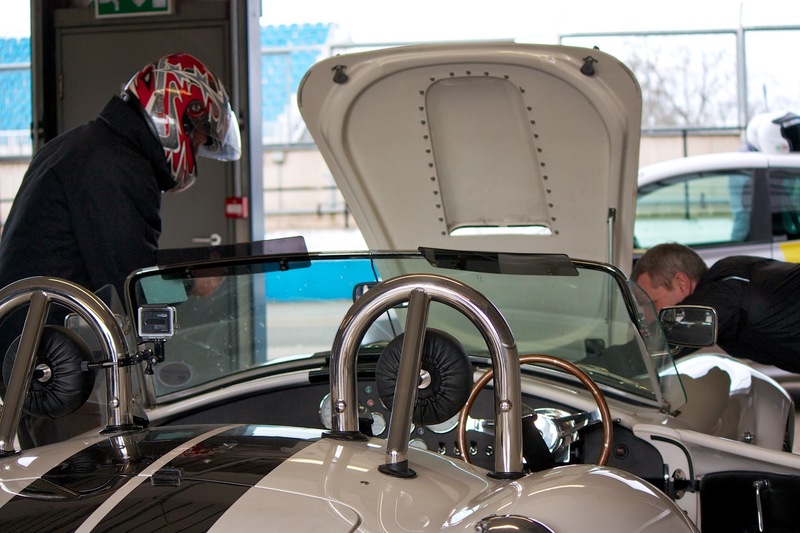 Chris then suggested that I let pro-driver and instructor, Pete Edwards take me out in Cobie so he could give me some feedback on its set up etc. Somewhat reluctantly/apprehensively/nervously I agreed. I gave Pete a safety briefing - its an expensive car, theres no insurance, its still being run in, I need to be able to drive it back home, etc , etc - and we were off. 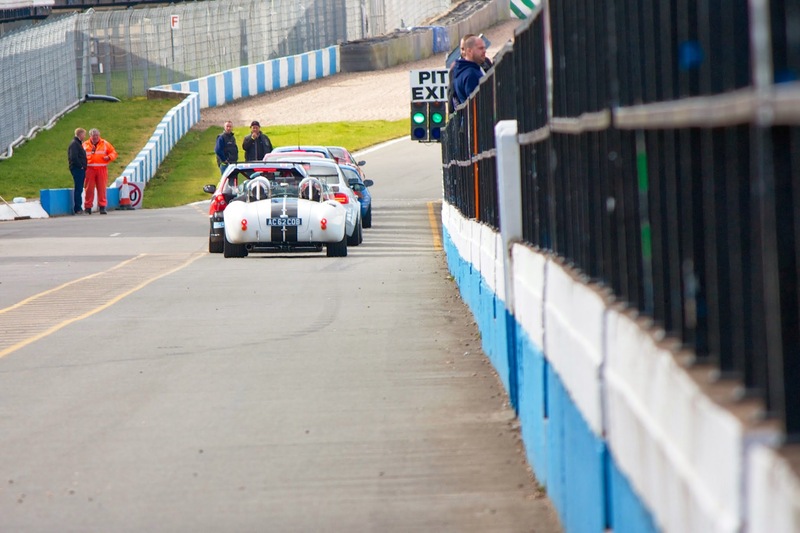 I soon discovered that unlike being a passenger in other track day cars its much more scary being a passenger in my own car. Also Cobie has nothing to hold onto which makes life more interesting. Approaching the Melbourne hairpin for the first time with Pete at the wheel I was beginning to think oh well 1 lap out of 3 nearly done, soon be back safely in the pits when the unexpected happened... yup you guessed it, Pete lost it on the exit putting Cobie in a 360 spin, off the track and onto the grass, ending up about 4 feet from the wall. Impressed... I was not!!! Two slower laps followed and Cobie was back in the pits - safe but shaken. 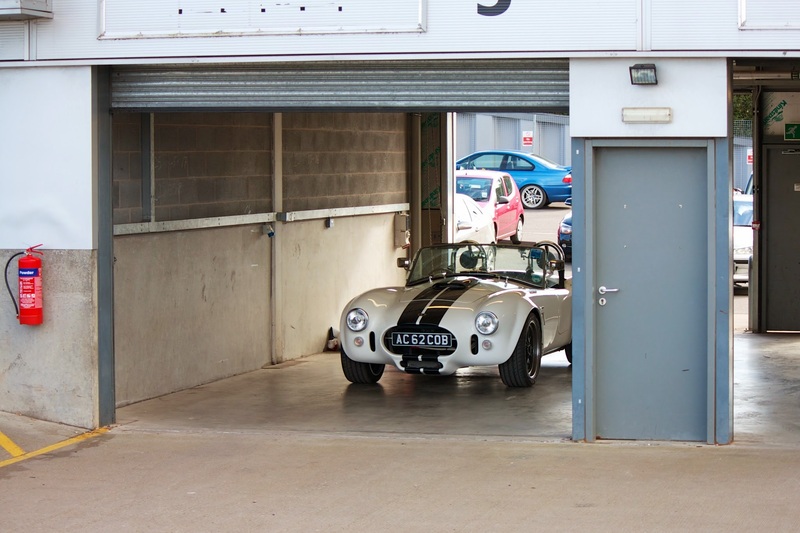 I had been advised previously that it makes sense to trailer your car to a track day - I never really got this until Sunday afternoon when, after an adrenaline packed session came to a close it was time to head home. The last thing I wanted to do was drive Cobie back down the M42 for an hour. Next time the Race Shuttle will be attached to the Range Rover and we will enjoy a more serene return. When's the next track day? ?